India's youthful manpower, a result of the demographic dividend, need to be provided with skills and ability to tackle global challenges. The more we give importance to skill development the more competent youth will be. It is important to predict the possibilities of the future, and prepare for them today itself. We have to make India the skill capital of the world. To protect the environmental right of our future generations, all of us have a green social responsibility. The fast evolving and emerging technologies in dynamic world to combat the menace of environmental degradation need to be complemented by specially trained and skilled manpower in various field at all levels. Imparting skill sets for greener transformation will generate employment opportunities and strengthen our resolve to conserve and preserve the priceless environment. India’s youth needed to be empowered with skill development with focussed training in their areas of interest. For instance, there is need for skill development at the grassroots to meet the challenges of hospitality and tourism industry in order to better harness India’s tourism potential. Most vocational training programmes focus on mechanical/technical skills rather than ‘soft’ or ‘green’ skills. Green skills contribute to preserving or restoring environmental quality for sustainable future and include jobs that protect ecosystems and biodiversity, reduce energy and minimize waste and pollution. In line with the Skill India Mission of Hon’ble Prime Minister, Ministry of Environment, Forest & Climate Change (MoEF&CC) utilising the vast network and expertise of ENVIS Hubs/RPs, has taken up an initiative for skill development in the environment and forest sector to enable India's youth to get gainful employment and/or self-employment, called the Green Skill Development Programme (GSDP). The programme endeavours to develop green skilled workers having technical knowledge and commitment to sustainable development, which will help in the attainment of the Nationally Determined Contributions (NDCs), Sustainable Development Goals (SDGs), National Biodiversity Targets (NBTs), as well as Waste Management Rules (2016). The candidates completing the Course(s) may be employed gainfully in the zoos/wildlife sanctuaries/national parks/ biosphere reserves/ Botanical Gardens/Nurseries/wetland sites/ State Biodiversity Boards/Biodiversity Management Committees/Wildlife Crime Control Bureau; industries (involved in production/ manufacturing of green products, as ETP operator); tourism (as Nature/Eco-tourist Guides), agriculture (as organic farmers/ green practitioners), education & research sectors as well as engage in waste management (in Municipal Corporations/ Councils/Urban Local bodies to advise on how to improve sewage, sanitation, land use services/ tackle pollution), water management, construction related areas, etc. Some of the courses enable the candidates to become self-employed. The first GSDP course was formulated for skilling Biodiversity Conservationists (Basic Course) and Para-taxonomists (Advance Course) of 3 months duration each, on a pilot basis in ten select districts of the country (covering nine bio-geographic regions). 94 Trainees successfully completed the basic course qualifying as skilled Biodiversity Conservationists and 152 Trainees completed the Advanced Course qualifying as skilled Para-taxonomists. BSI and ZSI were the nodal Centres for the pilot programme. Glimpses of Launch of GSDP-ENVIS Mobile App under ENVIS Scheme held on Monday, 14th May, 2018 at 12 noon by Dr. Harsh Vardhan, Hon'ble Minister, Environment, Forest and Climate Change, Government of India at Indira Paryavaran Bhawan, Jor Bagh Road, New Delhi. New Delhi: Around 560,000 people will be taught “green skills” such as pollution monitoring, wildlife management and mangrove conservation during the next three years, the environment ministry said on Tuesday. “The total budget allocation for the Environmental Information Systems (ENVIS) in budget 2018-19 is Rs24 crore, which marks a 33% increase compared to 2017-18, out of which the training courses under Green Skill Development Programme (GSDP) will be funded,” environment minister Harsh Vardhan said, announcing the move. GSDP is a recent initiative of the central government for skilling the country’s youth. An estimated 80,000 people will be trained during fiscal year 2018-19 under various skilling courses, while 160,000 will be trained in fiscal year 2020 and 320,000 in fiscal year 2020-21. “A total of 5 lakh 60 thousand people will be imparted training between 2018-19 and 2020-21,” Vardhan said. The first GSDP course was formulated for skilling biodiversity conservationists (basic course) and para-taxonomists (advanced course), for three months each on a pilot basis in 10 districts covering nine bio-geographic regions of the country. It was launched last year. After a successful pilot under which 248 people received training, the government is now expanding the programme to an all-India level. The programme will also include more green skills now. The government has identified 35 courses including pollution monitoring (air/water/noise/soil), effluent treatment plant operation, waste management, forest management, water budgeting and auditing, conservation of river dolphins, wildlife management, marine taxonomy and coastal biodiversity, mangroves conservation, bamboo management and livelihood generation. The environment minister also pointed out that an initiative has been drawn up to tackle climate change challenges. “The plan envisages planting 1,000 crore saplings over a period of 10 years, from 2021 to 2030,” according to an official statement. The saplings will be planted in different parts of the country under programmes such as Green India Mission, National Afforestation Programme and along highways and railway tracks. 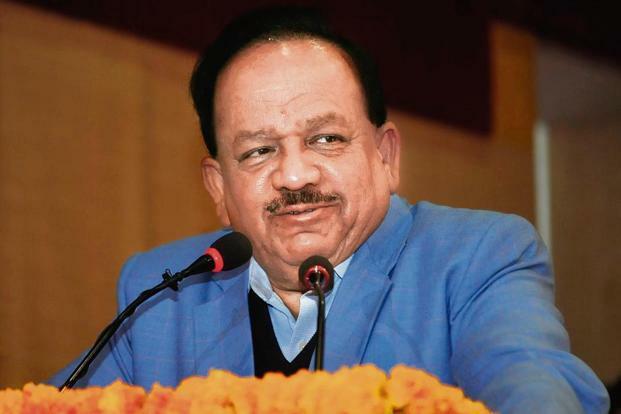 Vardhan highlighted the government’s efforts to tackle air pollution in 100 cities that do not meet India’s air quality norms in the next three years. He said it was proposed that each of the cities would reduce pollution levels by 35% in the next three years and 50% in the next five years under the National Clean Air Programme. The environment ministry said the programme will include expanding the monitoring network, conducting air pollution health impact studies, setting up air information systems, certification of monitoring institutions, air quality forecasting systems, carrying out source apportionment studies, support for strict implementation of actions for tackling air pollution, and increased international cooperation. The Union Environment Ministry launched its full fledged Green Skill Development Programme(GSDP) today that aims to train over 5.5 lakh workers in environment and forest sectors in the country through 30 courses by 2021. The Union Environment Ministry launched its full fledged Green Skill Development Programme(GSDP) today that aims to train over 5.5 lakh workers in environment and forest sectors in the country through 30 courses by 2021. Environment minister Harsh Vardhan also unveiled a related mobile app (GSDP-ENVIS) here, terming it an ambitious programme of the ministry that will help boost employability and entrepreneurship of the youth in the country. The GSDP was launched last year as a pilot project in 10 districts of the country wherein 154 youths (mainly school dropouts) were trained as parataxonomists and biodiversity conservationists. “After the pilot project, now we are going to launch GSPD on a large scale and 80,000 youths in the country will be trained at 80 institutions in next one year. The number will be raised to over 2 lakh in the following year and by 2021 a total over 5.5 lakh youths will be trained as green skilled workers,” the minister said. He said that GSDP was likely to become an important programme in the area of skill development in the coming days. “This is our prestigious and ambitious programme that will serve manifold purposes and achieve the aim of skill development campaign that is close to the heart of the Prime Minister Narendra Modi,” he said. The ministry through its Environment Information System(ENVIS) hubs and resource partners as well as other institutions across the country, will take up skill development of youth in the environment and forest sectors through 30 courses. The certificate courses, having duration of 80 hours to 560 hours, will be open for admission from July. The app can be used for more information and applying to the courses. Many of these course are open for admission to 10th and 12th dropouts. The bouquet of courses include some interesting ones like- river Dolphin conservator, water budgeting and auditing, forest fire management, management of small botanical gardens, propagation and management of bamboo, bird identification and basic ornithology, city environment surveyors among others. NEW DELHI: The Union Environment Ministry launched its full fledged Green Skill Development Programme(GSDP) today that aims to train over 5.5 lakh workers in environment and forest sectors in the country through 30 courses by 2021. Environment minister Harsh Vardhan also unveiled a related mobile app (GSDP-ENVIS) here, terming it an ambitious programme of the ministry that will help boost employability and entrepreneurship of the youth in the country. The GSDP was launched last year as a pilot project in 10 districts of the country wherein 154 youths (mainly school dropouts) were trained as parataxonomists and biodiversity conservationists. "After the pilot project, now we are going to launch GSPD on a large scale and 80,000 youths in the country will be trained at 80 institutions in next one year. The number will be raised to over 2 lakh in the following year and by 2021 a total over 5.5 lakh youths will be trained as green skilled workers," the minister said. He said that GSDP was likely to become an important programme in the area of skill development in the coming days. "This is our prestigious and ambitious programme that will serve manifold purposes and achieve the aim of skill development campaign that is close to the heart of the Prime Minister Narendra Modi," he said. The ministry through its Environment Information System(ENVIS) hubs and resource partners as well as other institutions across the country, will take up skill development of youth in the environment and forest sectors through 30 courses. The certificate courses, having duration of 80 hours to 560 hours, will be open for admission from July. The app can be used for more information and applying to the courses. Government has increased the Green India mission budget by 48 per cent and 1000 crore sapling plantation will be done between 2021 to 2030. The allocations include 20 crore for Green India Fund,350 crore for project tiger and 170 crore rupees for development of wildlife habitat. Taking the Modi Government's 'Skill India Mission' forward, the Union Environment Ministry has decided to impart ‘green skills' to over five lakh youths in the next three years for better job opportunities in the environment sector. However, though the skills provided by them are in demand, the Ministry does not guarantee employment, Union Environment Minister Dr Harsh Vardhan said on Tuesday. He said, a total of 5,60,000 people will be trained under the ministry's green skill development programme (GSDP) through 57 Environmental Information Systems (ENVIS) centres in the country. The fund for the training course will be from the Rs 24 crore budget allocated for the ENVIS in this year, the Minister told the reporters here on Tuesday. The ‘green skills' under the programme include - biodiversity conservationists, effluent treatment plant operators, air pollution abatement workers, equipment operators, waste handling and candidates for plantation sectors among others. He said that while in 2018-19 an estimated 80,000 candidates will be trained, in 2019-20 around 1.60 lakh youths would undergo training. Similarly, in 2020-21, there are plans to train 3.20 lakh youths and the total target for the three years is to train around 5.60 lakh youths. "All these skills are in demand and they will get jobs for sure," Environment Secretary CK Mishra said. The idea to impart training in the green skills followed the success of a pilot project launched under the GSDP last June wherein training course modules were released and about 94 trainees successfully completed the basic course, qualifying as skilled biodiversity conservationists. Around 154 students are enrolled for the advance course on para-taxonomy, which is expected to conclude in March, 2018, Mishra added. With the success of the pilot, the scope of the programme is being extended to an all-India level. Talking about the budget allocation, Dr Harshvardhan said on the wildlife front, funds to the tune of Rs. 175 crore have been earmarked for wildlife habitat development, i.e a 10 per cent increase and Rs. 66 crore have been set aside for conservation of aquatic ecosystems, an increase of 10 per cent. Environment minister Harsh Vardhan also unveiled a related mobile app (GSDP-ENVIS) here, terming it an ambitious programme of the ministry that will help boost employability and entrepreneurship of the youth in the country. The GSDP was launched last year as a pilot project in 10 districts of the country wherein 154 youths (mainly school dropouts) were trained as parataxonomists and biodiversity conservationists. "This is our prestigious and ambitious programme that will serve manifold purposes and achieve the aim of skill development campaign that is close to the heart of the Prime Minister Narendra Modi," he said. The ministry through its Environment Information System(ENVIS) hubs and resource partners as well as other institutions across the country, will take up skill development of youth in the environment and forest sectors through 30 courses. The certificate courses, having duration of 80 hours to 560 hours, will be open for admission from July. The app can be used for more information and applying to the courses. Many of these course are open for admission to 10th and 12th dropouts. The bouquet of courses include some interesting ones like- river Dolphin conservator, water budgeting and auditing, forest fire management, management of small botanical gardens, propagation and management of bamboo, bird identification and basic ornithology, city environment surveyors among others. ENVIS secretariat, Ministry of Environment, Forest & Climate Change, and Government of India makes no representation regarding the completeness, accuracy, or timeliness of any information and data posted on the Website or that such information and data will be error-free. In the event that the information on Ministry of Environment, Forest & Climate Change's or ENVIS Centre's official printed documents differs from the information contained on this Website, the information on such printed documents shall control and take precedence. Neither the ENVIS Centre nor the Ministry of Environment, Forest & Climate Change, and Government of India assume any responsibility for the consequences of use of such information, nor for any infringement of third-party intellectual property rights which may result from its use.